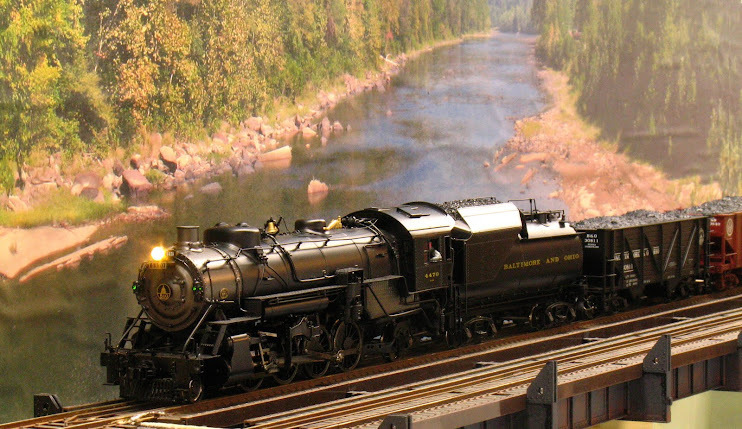 A few weeks ago, I appeared on the Model Railcast Show speaking about Photo Backdrops. For me, photo backdrops are the best alternative as I have little or no artistic ability for painting a backdrop. While the process of creating a photo backdrop sounds involved, once you have all of the tools together and pictures together, you can turn out a backdrop in 15 minutes - literally. Because my narrative on Model Railcast was not complete, I made the following video explaining and illustrating the process. After viewing the video, be sure to read my notes and outline below it. I've included two versions of the video. If you can use the HD/widescreen version you will be able to view the screen shots embedded in the video better. Try turning off HD in the play bar if your computer is running slow. For slow computers and slow internet connections, I've created a standard definition version. Be sure to use the full screen button in the play bar in either case. Computer – A reasonably recent computer, dual core preferred, but not required. Camera – Digital preferred, although film converted to digital or scanned photographs will suffice. ii) Commercial – s/w that came with your camera; Photoshop Elements – sometimes a free copy is included with your printer; Photoshop, Corel Photo Pro, etc. iii) Older versions of commercial software are sometimes available at a bargain price. iv) Get on mailing list of Corel, Adobe, etc. for outgoing versions at a discount. I just bought Corel Photo Pro 3 for $9.95 with free shipping directly from Corel. v) Trial versions – you can do everything with 14-30 trial versions of the best commercial software, you just have to get all of your work ready and dedicate the time to finish before the trial runs out. Use Adobe and Corel tools trial versions serially. Install on multiple computers. Camera- you don’t need a Gigapixel digital camera. You’ll be combining several photos into one thereby increasing the number of pixels. In addition, you want the backdrop somewhat soft, so it doesn’t attract the eye and detract from the trains. 7 MP is good enough. No camera necessary to use sky and scenic textures from GC Textures. Seek out vistas with a large expanse of scenery and sky. Alternately large industrial areas. 10 am – 2 pm flat light. Sun at your back, if possible. Use panorama or scene mode if available on your camera. Use a tripod, if possible, but hand-hold is OK. Pan level left to right. Set-up the stitch mode. Likely to be pivot rather than shift. Work in raw or TIFF if your camera offers it and your computer can handle it. Consider stitching only 3-5 photos at once. The 20-30 MB file that results will grow awfully large after resizing. Save the stitched file and a copy, do subsequent work on the copy. Adjust color, temperature, brightness, contrast, sharpness. One-step auto-fix, followed by individual adjustments. Remember you have an undo button. Most advanced photo suites have a tool to remove items from the scene, these may, or may not work. Against a backdrop of trees and/or wooded hills, the stamp tool can erase many ills. Add back trees, buildings other detail either photographed or obtained on-line. Scale to fit before inserting. Resize only after all other adjustments to your panoramic phot have been made. In your photo software, create a canvas at the size of you final print and with the native resolution of your printer (300-600 pixel/inch). Don’t go overboard on the pixel resolution, bigger is not necessarily better. Drop you panoramic shot onto the canvas; move to upper left corner. Use the resize/scaling tool. Lock the picture proportions. Expand in steps 10% at each step. Perfect Resize 7. In the final stages, it will take you computer a LONG time to complete each resizing, be patient. Do it during lunch, overnight, etc. At some point the process may fail on your computer/software combination. Change software, borrow someone’s computer. USB drives are handy for file transfer. A soft image after enlarging is OK, but it should not be not blocky. Work, universities often have large format printers. If your backdrop exceeds the capabilities of the printer that you have access to, then printing the backdrop in ‘tiles’ with or without overlap is possible. I found your blog while doing a google search for information on photo backdrops. WHAT A GREAT "HOW TO" VIDEO!!!!! I'm looking forward to seeing part 2. I hope to be well educated by summer time so I can hit the countryside with my camera! Thanks for simplifying what appeared to be a daunting task!